We had two members respond to last week's Tuesday Trivia - double the response of the week before! How many NJ AL championships did the Saints win, and in what years? Jo, If I remember correctly (and maybe I'm not - the 70s were a lot of fun you know), you could either compete in the show OR the parade. So my guess is '69. Purely a guess. If I'm way off base, DON"T PRINT THIS !!!! thanks. To answer your question: 26 World Series championships and 39 American League pennants. Ooops ... I think that is the Yanks, not us. I have no clue. I had forgotten about the either-or stipulation - thanks to Pete for the reminder, and to Jackie for confirmation. 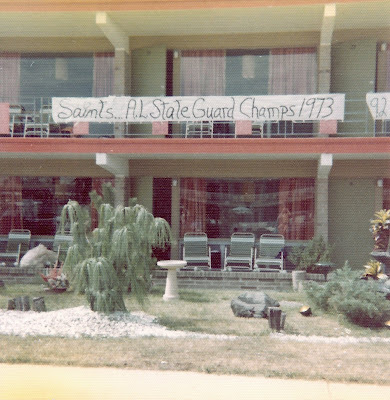 As far as how many and what years, the only one I can remember for sure is the guard field championship we won in 1973 (see the picture from the balcony at the Cara Mara below). We may also have won the guard title in 1972, but can't really say for sure. I seem to remember at least one parade win (could be the 1969 thing that Pete remembers), and I thought the corps won the field show once as well (1976?). Thanks to my little brothers for responding! Ready to send in your answers? Click here to submit, or if that doesn't work, send them to joparente DOT saintsdrumcorps AT gmail DOT com by the end of the day (whatever your time zone) on Monday, July 6th. What is Lisa's last name, and who is she related to in the Saints? Hmmm ... she looks like a nice enough girl (except for the orange jacket, but that is my personal demon to deal with). Would you believe Peter Boyle's daughter? Oh wait, I know exactly who she is related to ... Jo - it is your third cousin; Floyd on your father’s side who had a nephew by marriage whose wife had three sisters: Betty, Bonnie and Beatrice. Bonnie had four children, the third's name was Samuel who had six kids by his fourth marriage, the youngest which had two girls - twins each named Lisa (because she couldn’t decide which child to name Lisa). Lisa (the younger) had three kids named Lisa, Lisa, and Lisa. This is the middle child: Lisa Parente! Well, Jackie did correctly guess that I do, indeed, have a cousin Lisa Parente - she's a SECOND cousin (daughter of Greg, who's the son of Greg, and who has a son Greg and a grandson Greg) ... but it's not that Lisa. As far as the orange jacket goes - that was the inspiration for the Trivia question. The real answers are - Lisa isn't related to ANYONE from the Saints, and her full name is Lisa Marie (Venezia) Lawrence. She's a member of the 2009 NJ American Legion State Champion Melrose Blackhawks, and is part of the all-girl mello line. She stopped by the mini-reunion for a bit on the way back from Wildwood. Ready to send in your answers? Click here to submit, or if that doesn't work, send them to joparente DOT saintsdrumcorps AT gmail DOT com by the end of the day (whatever your time zone) on Monday, June 29th. Well, Maybe, Maybe Not turned into more of a Definitely Not. 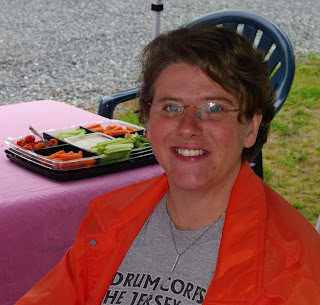 Lisa (pictured below) was with us at the gathering at Pete and Kim Crafts' home on Sunday. Ready to send in your answers? Click here to submit, or if that doesn't work, send them to joparente DOT saintsdrumcorps AT gmail DOT com by the end of the day (whatever your time zone) on Monday, June 22nd.